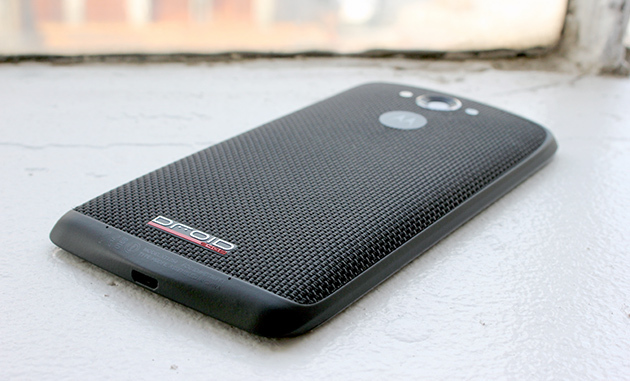 Verizon's Droid Turbo is a curious little beast: It's a distinct improvement over Motorola's one-time flagship Moto X, but it lacks the sort of geek credentials that have gotten people drooling over the newly announced Nexus 6. That said, we were a little taken with just how seriously Motorola still takes its long-running Droid line, so join us as we take a quick look what's worth knowing about the Turbo. First, let's consider the way this thing looks. As usual, Verizon has insisted that Motorola's curvaceous design language and materials be replaced with a flatter look, not to mention a chassis hewn of either ballistic nylon or metallized glass fiber. The glass weave makes for a very familiar look (the Droid Ultra was made of the same stuff), but the nylon is a step in a distinctly more rugged direction. Rubbing your fingers along that back is like caressing a pricey, outdoors-y backpack, but -- thankfully -- it lacks the heft you'd normally expect from such a tough-looking package. 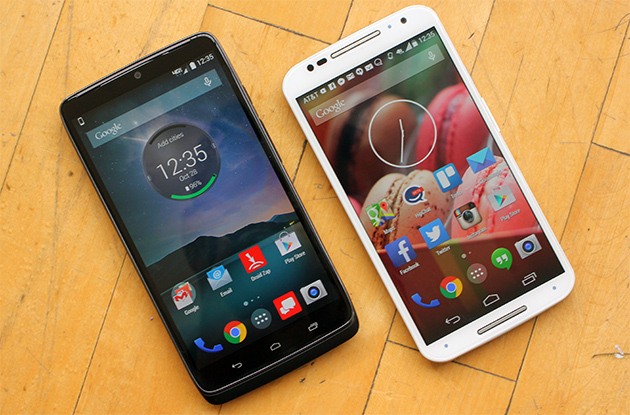 In fact, it's just about as light as the second-generation Moto X, give or take a few indiscernible ounces. Let's be honest though: The real star of the show is that Quad HD display sitting right up front. Motorola isn't exactly new to the super high-res game -- the Nexus 6 packs a screen with the same resolution -- but with the Turbo, Motorola took all those pixels and crammed them into a smaller 5.2-inch screen. Not only is it an incredibly crisp display, but also Motorola says it's the most pixel-dense screen you'll find on a smartphone... though it takes more than just that to make a screen worth using. In our quick, extremely unscientific side-by-side test, color reproduction was mostly similar to the Moto X, though the screen seemed cooler and a smidgen less bright when cranked up to the maximum. Kind of a bummer, but we'll see how it stacks up to other displays soon. Thankfully, Verizon once again exercised a light touch when it came to the Turbo's software -- it runs a mostly stock version of Android 4.4.4, festooned with just a handful of Verizon apps to get in the way. Oh, and all the same contextual smarts we saw in the Moto X (like displaying notifications with a wave of a hand, and the ability to listen for your voice commands) are here too, and work as well as they did on the Turbo's more customizable cousin. Really, the only substantive addition is Droid Zap (which lets you very quickly beam photos and media to people nearby) and the reappearance of that circular Command Center widget that shows your remaining battery life, upcoming calendar events and local weather forecast. The fact that there isn't much software cruft here to get in the way also means the device runs smoothly (which is surely helped by the quad-core Snapdragon 805 clocked at 2.7GHz thrumming away in there). Getting a feel for performance in the field is always a tricky proposition, but when it came to firing up apps and furiously scrolling through every website we could think of, the Turbo handled it all with ease. And then there's the electrical elephant in the room. The Turbo packs a whopping 3,900mAh battery, which Verizon says will power the thing for up to 48 hours (thanks to some helpful software tweaks). Alas, Verizon probably wouldn't like us squatting in their space for the next two days, so you'll have to wait for our full review to see how well that big ol' battery actually works. Fingers crossed!